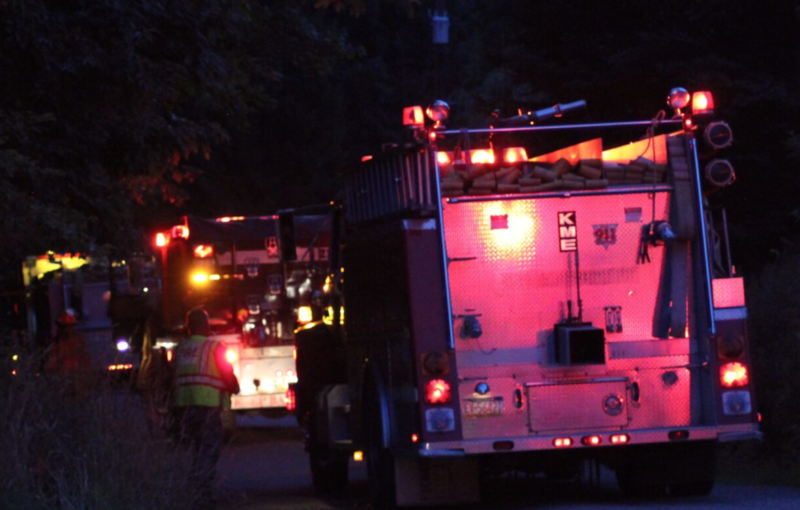 MADISON TWP., Pa. (EYT) – Multiple area volunteer fire departments responded to a structure fire Wednesday night in Madison Township, Clarion County. Clarion County 9-1-1 received a call reporting a fire at a residence located at 145 Switzer Road in Madison Township around 8:54 p.m.
Rimersburg Hose Company, Sligo Volunteer Fire Department, New Bethlehem Fire Company 1, Callensburg Volunteer Fire Department, Clarion Fire & Hose Company No. 1, East Brady Volunteer Fire Company, and Southern Clarion County Ambulance were dispatched to the scene. Chief Jim Foringer of Rimersburg Hose Company said the fire began in the kitchen, most likely as a grease fire while one of the residents was cooking. The residents were able to safely escape the structure. One individual was checked over by EMS personnel at the scene but didn’t require medical transport. According to Chief Foringer, the structure was a complete loss. The fire destroyed most of the lower floor and a portion of the upper floor, and the structure also additional sustained smoke, heat, and water damage. Chief Foringer said the residents were planning to stay with family members who live nearby. The scene was cleared Thursday at 1:15 a.m.